Hartsville, SC is a charming city of nearly 8,000 residents. They are also a leader in government communication and responsiveness to citizen concerns. Hartsville began using SeeClickFix in 2012 and they continuously give exemplary attention to every citizen request. The most commonly reported issues include pothole and sidewalk problems, trash and debris removal, overgrown lots and tree-related issues. Both residents and city employees welcome beautification projects, adding to the overall livability of the city, including a new swing set and flower beds in Lawton Park. Read the rest of Natalie’s message to her residents here. We are impressed with the high level of citizen and city engagement and accountability in Hartsville, and look forward to witnessing the continued improvement of the city! Today, New Bedford, MA officially launches NB Connect! 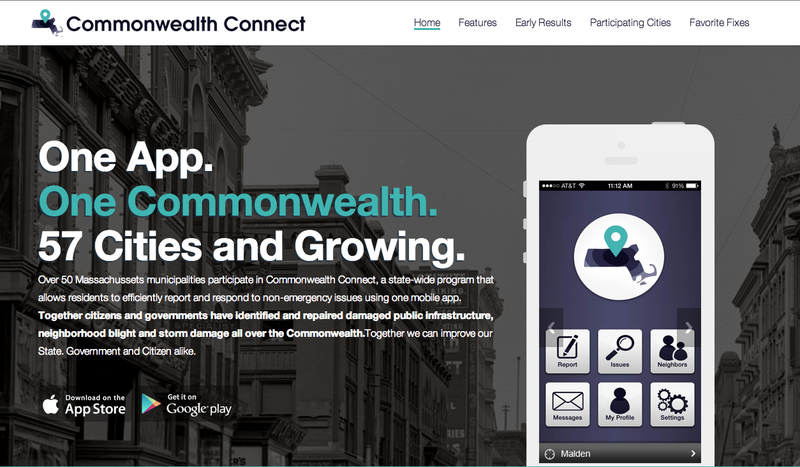 The city joined our community nearly a year ago by way of Commonwealth Connect, a program made possible by the Community Innovation Challenge Grant. The City of New Bedford's launch is focusing specifically on graffiti prevention and removal through its "Graffiti Free NB" campaign. City officials are encouraging all residents to document instances of defaced property with a detailed report that includes photos (if possible). New Bedford will use EcoQuip, a machine that removes graffiti from metal, concrete, brick, wood, and marble surfaces using water, an air compressor, and fine abrasive grit to restore vandalized property. However, in certain situations, the city will simply use a tried and true technique and cover markings with a coat of paint. New Bedford is also implementing two new graffiti related initiatives: a graffiti reward program and a program that aims to increase artistic creation. The graffiti reward program offers a city issued 500 dollar reward to individuals who can provide evidence that will help the city apprehend and convict anyone who has vandalized private and/or public property. The mural creation program hopes to combat graffiti with art through a partnership between the Office of the Mayor, 3rd Eye Unlimited, the UGLY Gallery, and NB Beautiful. The program will sponsor murals across New Bedford that will showcase the work of local artists. Residents can report issues through the NB Connect app, the city's website, or the city's SeeClickFix homepage. To read more about yesterday's launch event you can go here, here, or here. To see EcoQuip in action, check out this video! When Ben first pitched me the idea of SeeClickFix, I was excited by its potential to change the public space. Until then, I would say I had been moderately engaged in the civic life of New Haven. I voted dutifully in each election and participated in a community garden. I was a member of New Haven's first "Democracy School" classes. I half-heartedly volunteered for campaigns and haphazardly donated to them. As we grew SeeClickFix from an idea, to a project, and finally to a business, we realized we needed to draw some clear lines. Since we were selling software to government entities, we decided that one of our most important boundaries would be to remain politically neutral. That meant not volunteering on campaigns, not supporting individual candidates, and not donating to candidates. During New Haven's past election season, candidates vied for an open mayoral seat. This was the first time in nearly twenty years that New Haven residents would elect a new mayor, which led to active campaigning across the city. SeeClickFix, however, remained committed to our pledge and did not participate in any campaign activities. The election is now over and it comes time to govern. The Mayor-Elect Toni Harp Transition Team has asked me to be a part of its Economic Development Committee. I accepted the position and wanted to elaborate on the thought process behind my decision. -The campaign is over and this is about serving when called. -This is an advisory role not a decision making role. -Participation is not about a particular party or candidate, but instead about making New Haven a better place. I would love to hear any suggestions I can give to the transition team. I would also appreciate opinions on whether or not you believe my decision errs on the side of political neutrality. You can reach me in the comments below, by email (kam@seeclickfix.com), or by cell phone (412-414-7537). Over the past few months we have participated in an annual awards event sponsored by FT and Citi. Last night, we were fortunate to share dinner with social entrepreneurs and others who were also nominated for one of the 5 regional awards for their work to improve cities around the world. FT and Citi put together great showcase videos for each project and played them before the announcement for each category. I was caught off guard when they announced SeeClickFix as the regional winner for North America. My fellow nominees were so inspirational, and I was particularly taken with the work that has come from The Competitiveness Company in Jamaica. I met Beverly Morgan, head of TCC, in San Francisco last month. Her solution to urban violence floored me. In short, Beverly has created over 100 small business owners out of gang members who have turned their backyard hobby of reselling tropical fish into a career. Last night in my acceptance speech, I reflected on my kinship to Beverly and TCC. SeeClickFix is a place where communities can find their weak spots and seek to repair them. TCC is a testament to discovering your strongest muscle and strengthening it. Since learning of the initiative, I've been wondering what New Haven can designate as its 'tropical fish.' No answers yet, but I'm curious to know what other's think. Maybe it's food? The global winner out of Nairobi, Sanergy "provides sustainable, hygienic sanitation inNairobi’s slums through an innovative toilet franchise system that generates additional income by recycling human waste to create electricity as well as organic fertiliser for farmers." Also runners up for the North America Award were the Smithsonian's National Portrait Gallery and Baltimore Housing. I'll be joining folks from the National Portrait gallery on a Satellite media tour out of New York this morning. We would like to thank FT and Citi who have helped give an even larger megaphone to SeeClickFix. From this morning's press opportunity and the most recent highlight in today's FT Magazine to the video below, we are confident that this will take SeeClickFix to the next level globally. Last week I had the pleasure of joining two brilliant women, Christina Gagnier and Marcy Harris, in Sacramento at the California Innovates conference. Marcy is the founder of PopVox.com, a platform similar to SeeClickFix for putting "your message in the language of Congress". Christina is the founder of Trail as well as one of California's leading privacy attorneys and host at Techwire.net. I've been lucky to know both Marcy and Christina since about 2010 but this was the first time I was able to join them on stage. Christina did a great job with the Interview and it was refreshing to hear Marci share a similar motivation and experience in popvox with SeeClickFix. 1) A communications problem can only be solved well by addressing the speaking and the listening tools. 2) Tools that attempt to work with the government for the citizens make the most successful public engagement platforms. “Biking is definitely on the rise,” said Jennifer Baldwin, Bicycle and Pedestrian Coordinator for the City of Raleigh. The city has made numerous investments to advance bike-friendliness, including bike lanes and infrastructure. Now, the city harnesses technology and one of its greatest resources for bike rack planning: its residents. For two weeks in November, Raleigh residents proposed bike rack locations throughout the city. Raleigh used SeeClickFix as a platform for crowdsourcing – bringing together people, ideas and resources - to determine the best locations for these new racks. A bike rack at the Moore Square parking deck means residents would no longer need to attach their bikes to poles and staircases. Additional bike racks in Blount Street and Person Street also received ample citizen endorsement. Raleigh citizens will be able to make monetary contributions - also known as crowdfunding - through neighbor.ly for artistic bike racks. The specific bike rack locations have yet to be decided, as a number of factors need to be considered. Jennifer Baldwin noted that popularity and demand are major factors in selecting the locations. However, the city also needs to determine whether the bike racks will actually fit in the proposed locations and whether they are on state right-of-way or city right-of way properties. The initial planning of the crowdfunding initiatives began earlier this summer and the city continued promotion of this service request on their site and through local press. Stay tuned for the final locations and pictures of these bike racks! On June 5th of this year SCF user 'beautify' was the first to click the newly released "Thank You" button upon the clean-up of a large pile of illegally dumped material in the city of Oakland. Yet to be exposed in the API, the widgets or the mobile apps the "Thank You" button currently exists on the SCF website. On Thanksgiving there are now 6,000 thank you's that have been sent to public officials and others who have helped to fix issues around the world. Just yesterday I clicked "Thank You" when awesome neighbors and SCF power user Juli helped return a lost puppy home the day before Thanksgiving. The "Thank You" button appears in place of the vote button when issues are resolved and on Fridays the platform sends a condensed email of all the Thank You's that the fixer has received for that week. Here's all of the fixed issues in the United States if you want to spend some time thanking Public Officials today. Meet Tucker: New Addition to the SeeClickFix Team! Hi, my name is Tucker Severson. I am the newest member of the SeeClickFix sales team. I spent the past four years in Burlington VT, where I initially designed, built and ran a German restaurant named “Das Bierhaus” at the bottom of Church Street. If you are ever in the Burlington area, make sure you check out its rooftop biergarten! I spent the second two years in VT working as a director at the Vermont Center for Emerging Technologies (VCET) — a state funded seed capital and startup incubator. I have a BA from Bates College and an MBA from the University of Vermont. I am thrilled to be a part of the team at SeeClickFix. This is a really exciting time for our municipal partners and the citizens that they serve. Government transparency, citizen engagement and flexible web technologies are transforming the way democracy is being served across the country and I feel lucky to be a part of this incredibly powerful trend. I especially look forward to learning from our government partners and lending a hand as they build the next generation of civic communication. If you have any questions about how SeeClickFix can help your community, don't hesitate to reach out to tucker@seeclickfix.com. Over the weekend two volunteers, Nick and Andria, along with myself went out to a location in New Haven where there is lower usage on SeeClickFix. Our strategy was to use a campaign technique where we asked folks on the street what they wanted fixed in the neighborhood. We then offered the solution of reporting the issue on SeeClickFix as opposed to a candidate to vote for. The first person we ran into knew all about SeeClickFix and could have been an evangelist herself. We probably should have recruited her to our team. The next few folks did not know about SeeClickFix but we were able to report a few issues for them and add them as followers on the issues. We have already started talking to the next Mayor of New Haven's transition team about focusing on larger user adoption locally. In the meantime local volunteers are seeing the difference that SCF makes in neighborhoods with large adoption and getting the word-out. Take a look at Ben's most recent interview with a North Carolina SeeClickFix-er on Medium. You can find additional interviews on Ben's Medium profile. 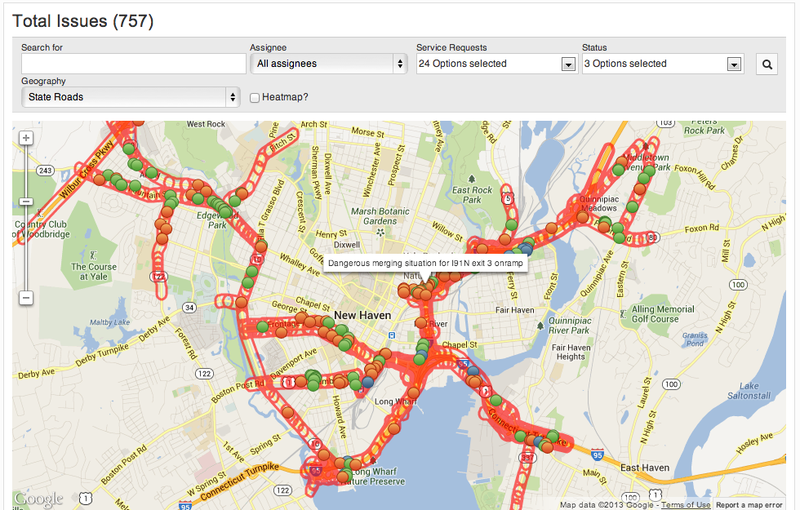 A Model City after all - 5 Years in Open Data and Open Communication from the City of New Haven. As Mayor Destefano's Administration prepares to leave office a legacy of open governance and accountability will be left for future administrations and citizens of New Haven as well as other parts of the world that have made use of the software that they have guided in development. Chief Administrative Officer Robert Smuts, Ethan Hutchings, Evan Trachten, Kathy Hurley, Jennifer Pew, Jim Travers, Mike Piscitelli, Chief Esserman and many more City officials have equally been responsible for driving much of the back-end workflow management and reporting software that helps the City of New Haven better respond to its citizens and measure its own performance. The City of New Haven was one of the first cities to react proactively to citizen reports generated on SeeClickFix. As opposed to treating the added feedback loop as a painful disruption, City Hall took it as an opportunity to improve its internal processes as well as their external communication. Bureaucracy is slow to change to protect its citizens from single-serving and risky decisions but it does not need to when citizens show up in mass looking to help make that change together. The City of New Haven was not only keen to use the tool to hold themselves accountable but also to hold accountable and ask for assistance from other agencies and individuals. Regional Water Authority, United Illuminating, AT&T and Southern CT Gas have all responded to issues because of the City's leadership and routing of those issues on the platform. Yale University's Police Department and the New Haven Police Department have also used the platform to receive communication and provide feedback. Southern CT State University has been encouraged to use the platform for their students and visitors to the campus. Central Animal Hospital has been using the platform to reconnect neighbors with lost pets taking some burden off the City. Most importantly because they were the very first to work with SeeClickFix the Town Green Special Services District uses the platform to divide and respond to issues in downtown that they deem fixable without City Hall's help. On top of the downtown SSD the various neighborhood associations and block watches that have reported issues for a large group of folks have all come to the table to discuss openly the improvement of our City with our City Hall. Many Aldermen have started communicating openly on SeeClickFix with their citizens as well. Most recent of note including Alderpersons Doug Hausladen, Justin Elicker and Jessica Holmes. As well as State Senator Roland Lemar who was one of the first Aldermen to communicate on the platform. Most recently CT Transit has followed the Yale Shuttle's lead and has started responding to reports about public transportation. And then there are all of the citizens of NHV who came to the table not only to tell City Hall what was wrong but to offer to help when they realized that the City was listening to them. The urban resources initiative and its volunteers documented hundreds of completed beautification projects and tree plantings and leveraged the the tool to bring more volunteers to the table. Claudia Herera in Fair Haven translated promotional materials into Spanish to help get out the word to her neighbors that there was a new way to communicate with City Hall and the City never overlooked the valuable feedback of the site's most prolific users Mark Abraham and Brian Tang. Most importantly there has been the additional oversight and coverage of the conversation and data by news platforms New Haven Independent and the New Haven Register who have launched SeeClickFix with all of its papers around the Country. As well as the web exposure by organizations like Lee Cruz and Chatham Square Neighbors and local broadcast journalists at WTNH Erin Cox, Chris Velardi and Ann Nyberg. The City of New Haven used a platform that could allows others to help them maintain the public space because without that help they would not have been able to maintain the quality of that great and aging resource. The citizens of New Haven have continued to step up while passively agreeing to deal with beta versions of many SeeClickFix features as well as the occasional (more than occasional?) victims of too much email. The City is currently working with SeeClickFix to tie into the back-office software for the building department as well as beta testing an open knowledge base for City Hall and citizens. Volunteers are also meeting to help spread the word to low use neighborhoods. SeeClickFix was modeled here in New Haven and we're thankful and proud of that every day. Our goal is to work with the City of New Haven to reach every neighbor and help them drive the direction of the City while giving them easy access to hear from the City and their neighbors. Much of the hard internal work has been done at City Hall to help officials respond efficiently and 13,000 neighbors have been connected. Now the hard work starts to get everyone else to the table. We're looking forward to working with the next administration in welcoming many more voices. The current state of all SeeClickFix service requests in the past few years to City Hall are below. This does not include requests on SeeClickFix for help from neighbors or other parts of the community such as finding a lost pet. Roll over the sections to see the scale. 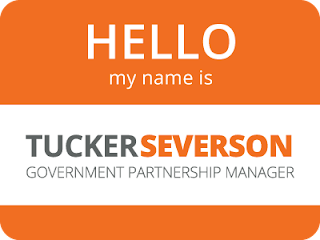 SeeClickFix Government Partnership Manager Ryan Mannion and I are both at the National League of Cities Congress of Cities and Exposition in Seattle, WA today and tomorrow! If you or any representatives from your municipality are attending the conference, please be sure to stop by booth #915 and say hello! Our booth is directly between two street lamp and traffic sign vendors. You literally cannot miss us! We're looking forward to meeting you, learning about your city's CRM needs, and showing you some of the innovative ways SeeClickFix clients have been using our platform! A recent study in New Haven showed that SCF reports are inverse to crime. This has inspired a few folks to attempt to drive up SCF usage in these higher crime communities to see if there is any correlation in the increase in reports to the decrease in crime. While we're not naive to think that poverty, lack of education, drugs, gangs and the other usual suspects of contributing factors to high crime neighborhoods are going to magically go away, we would also be naive to think that better communication might not help improve things. On Thursday at 6:30 PM all are welcome to a working session to help get out the word about SCF in neighborhoods where reporting is lower than average across the City of New Haven. If you're a marketing guru, campaign master, designer or a behavioral psychologist this would be a great place for you. As always engineers and programmers are always welcome too. It has been exciting to see the use of open data in the local press in stories like this one and this one, and to see Seattle's former CTO recommend a program similar to Commonwealth Connect. For help with data inquiries email contact@seeclickfix.com. "SeeClickFix began to engage this small army of Guerrilla Citizens improving the City." —Raleigh City Councilman Bonner Gaylord telling TED how SeeClickFix sparked a civic movement in Raleigh, NC. One of my favorite SeeClickFix communities is Raleigh, NC. It waslocal broadcaster WRAL that originally paid for the pro version of SCF and it was Bonner Gaylord that brought us to town, but it was City Hall and the citizens that have created a legacy of civic engagement. Bonner told that story to TED in Raleigh last week. Here's the slide show with the presenter comments. Click the gear to see the presenter notes. This past year we have seen a number of interesting trends with our partner cities. The most intriguing, from my point of view, is the rapid adoption of our "City Initiated" functionality released earlier this year. Traditionally our platform has been focused on initiating a transparent communication loop when a citizen submits a new service request to the city. While the citizen created reports are still core to what we do they only tell half the story. The other half, is represented through service requests created by city employees. We are seeing a rapidly increasing trend of city initiated service requests on SeeClickFix, depicting an unprecedented level of commitment by city administrations to make data more open and accessible. Instead of pushing for doors to be opened and data let out of systems after they have been built, we started with the data accessible. Using open data as a starting point coincides with the movement of the web to be open, social and shareable by default. I think this concisely summarizes what we are trying to achieve. By encouraging city staff to report on the same platform their citizens are using we build an even deeper level of transparency into the process. The fact that SeeClickFix is built with both the city employee and the citizen equally in mind still strikes me as one of our more unique qualities. Both play integral roles in the success of a city, so facilitating an open and accountable communication is only natural. "Cities have the capability of providing something for everybody, only because, and only when, they are created by everybody"
SeeClickFix Announces the SCF Fellowship and is Taking Interviews Starting...Now. Connecticut Innovations and CTNEXT, two quasi-public entities in the State, requested proposals for ideas on growing the entrepreneurial community in Connecticut. We were immediately intrigued and submitted a proposal that would help SeeClickFix grow while also helping to create new businesses in New Haven. The proposal was generated from a premise that there were key factors that helped SCF go from idea to start-up and that those factors could be replicated for others looking to launch businesses. We were excited to find out this morning that the SCF Fellowship program has been awarded and we can immediately start interviewing candidates. WOOT WOOT! -Access to software technical know-how. -Access to business technical know-how. -Access to start-up technical know-how. -A very short timeline with a concise cut-off point. -A low-stress workday that allows for high-energy nights-and-weekends commitment to your project. -Aspiring entrepreneurs with a business that they have already started working on but have not yet fully committed to. -Someone who's willing to work nights and weekends on their start-up for the next 6 months. -Someone who's looking to learn about operating a start-up through osmosis. -Awesome and feasible businesses ideas that will help grow New Haven's economy. -Software and web-based businesses are preferred as we think that's where we will find the best fit… but we won't rule out others. -and gain a boat-load of experience and make connections with a company that has been through it all before you are kicked out on to the curb to launch your thing. UPDATE: "The Grove is proud to announce a collaboration with the SCF Fellowship Program. Graduates of the SCF Fellowship Program will receive 6 months of full time coworking space at The Grove. This will help keep these growing startups connected to the resources and expertise they need to grow and scale their business. It will also keep them connected to New Haven's growing startup community." 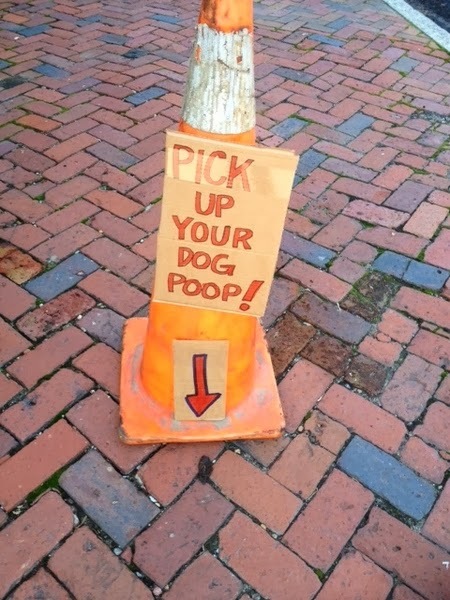 Traffic Cones, Creative fixes and dog poo. I will be the first to admit that there's been times when I forget to bring the bags when I'm walking Del and Pepper. While its not often it happens I'm sorry anytime I've slipped up neighbors. Folks in Richmond, VA have a solution to keep me from forgetting and its pretty darn funny. I've seen the signs on lawns that ask you to 'curb your dog.' This is the first time I've seen traffic cones placed by the offending remains. I'm going to follow along with the issue to see if the cone technique works for the neighbors in Richmond. As silly as these little things seem they do cause really friction between neighbors. Any solution that might help neighbors get along better seems worth highlighting. As you could imagine, overlapping seven years of crime incident reports and SeeClickFix service requests in the city of New Haven yielded some interesting results. The map below was generated by DataHaven for a presentation this week at the latest in a series of Civic Hack Meet-up hosted by SeeClickFix. Wilson and Kelling published their famous "Broken Windows" theory back in March 1982, which suggests there is a direct correlation between urban disarray and crime. After conducting a number of interesting social experiments (in both the Bronx and Palo Alto) they go on to state that maintaining and monitoring urban environments can play a key role in curbing the escalation of vandalism into more serious crime. Seven years worth of data seems to suggest a similar pattern. This week we signed the Utah Department of Transportation and announced a new routing feature based on road data. One of the most valuable features of the SeeClickFix platform has always been the unique ability to route service requests to the proper individual in the proper department in the proper city, county, state, or other geo-political boundary. We recently updated our service request functionality to allow for the creation of routing areas based on road center-line data. We are pleased to announce that the State of Utah will be the first to make use of this feature through their Department of Transportation. Here's an example of how this feature works: the map below shows all issues that have been reported in New Haven, CT on state maintained roads. In the future we can ship those issues off to the Connecticut Department of Transportation in an automated fashion based on a quick upload of their shapefiles into our geography zone manager. In the future, a citizen who wants to report a pothole on a state road will not need prior knowledge that it is a state road. SeeClickFix will provide the information for the reporter and route the request appropriately. This functionality will be valuable for state-level Departments of Transportation as well counties that manage a complex array of roads within multiple town boundaries. As resources become more constrained, the geo-dynamic cloud based nature of SeeClickFix will allow more municipal entities to work together to share communication resources and think and act regionally. In North Carolina, the Bay Area, Massachusetts, Georgia, Minnesota and other states we are already seeing a regional use of SeeClickFix spreading rapidly. The road center-line filtering feature will surely help Departments of Transportation and other regional organizations manage citizen response more efficiently. I had planned to be in London in this week for a great event at Google but, due to travel complications, a recorded version of myself will be presenting a short white paper I published on SeeClickFix. The focus of the event is to measure the 'fix-rate' of social ventures. 'Fix-rate' by many other names is fast becoming a key performance indicator for many social ventures. 'Fix-rate' measures the frequency that the intended result is returned to the individual or individuals who have engaged with the platform. In a highly functioning system, the energy that goes in is dwarfed by the energy that comes out. The time it takes to snap a photo is now worth 100 positive affirmations from friends on Facebook, a repaved road on SeeClickFix, or a launched product on Kickstarter. As London is currently celebrating accountability and transparency week, you may be aware that there are a series of events taking place in London culminating in the Open Government Partnership (OPG), a big international conference on openness and transparency. To acknowledge the importance of this week, Integrity Action, a British based NGO committed to designing out corruption in development programmes through building #integrity in local communities, is hosting a conference with Google (UK) on "Closing the Loop with Transparency, Accountability and Integrity". By closing the loop Integrity Action means the triggering of an intelligent or informed response to a specified problem. The organisation just recently published the Fix-Rate paper (http://www.integrityaction.org/statistics-measuring-fix) which gives some examples of how the loop may be closed. At today's conference, Integrity Action aims to compare and learn from experiences that actively seek to achieve this. In order to have some comparability the conference focuses on the handful of initiatives - some by government, others by NGOs - that are able to close the loop on specific problems. In most cases, these are interventions that have been conducted at least twenty times and where there were at least 10,000 direct beneficiaries. It is important to note that although a large number these interventions are technologically driven, all cases involve some from of citizen engagement. Commenting on the conference Fredrik Galtung, CEO of Integrity Action, said that "far too many anti-corruption efforts fall short of closing the loop. Closing the loop ensures that citizen have the opportunity tell us how it really is and that they are empowered to ensure that policies are appropriate, information can be trusted and that fewer public funds are wasted".